The family of an 88 year old man in La Junta, Colorado won a $3.2 million settlement after suing Pioneer Healthcare Center, a Rocky Ford nursing home and the nursing home the man was being cared for in when he died due to complications from a bed sore the size of a baseball. After the man developed the bedsore, it was claimed that both the bedsore and resulting complications were hidden from the man’s family. Bedsores are caused by pressure on the joints when a patient does not move for long periods of time and the result is an open sore caused by tissue death that is extremely painful and can become infected and contribute to a number of complications that includes death. Fraizer began his stay at the nursing home in 2009 and was also employed for the facility as a janitor. He had Parkinson’s disease, and eventually found himself confined to a bed and not eating or getting proper hydration. By October of 2010, Fraizer had sores on his buttock and scrotum which were easily noticeable by the smell that accompanied them. Regardless of this fact, the nursing home did not inform Fraizer’s family of his condition and it was not until a nurse’s aide came out and informed the family that the family was finally aware. Bedsores, also known as decubitus ulcers, are extremely painful sores that can be prevented simply by changing the position that a bed ridden patient is sitting or lying in every two hours. In their early stages, bedsores are easily treated and detectible. However, once a bedsore reaches stage two, it becomes an open wound that is subject to numerous complications that include infections and sepsis. What causes the wound is tissue death from lack of circulation and when the tissue dies, the skin and muscle begin to deteriorate. 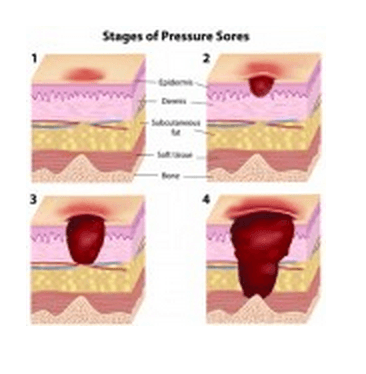 Stage four pressure sores are open wounds that involve severe tissue damage that extends all the way to the bone. It is impossible not to let a patient develop a stage four pressure sore without knowledge of the sore unless there is severe neglect. In the case of Fraizer, his sores were highly noticeable through the smell that accompanied them and the size and magnitude of the sores. The nursing home staff was not only aware of the problem, but the staff failed to treat the sore or inform the family of the man’s condition. The employee that spoke out was fearful of losing his own job, but finally did so out of fear that Frazier would die of the sores. To further exacerbate the level of negligence, the nursing home administration protested when Frazier’s son demanded that he be taken to a hospital immediately for treatment of the wounds. Doctors at the hospital found that Frazier had been dehydrated and malnourished to the point of severe neglect and he died due to complications related to the bedsores. Upon further review, the Colorado Health Department found that the facility had 27 code violations and the residents were grossly mistreated and uncared for. There were numerous widespread infections in the facility and numerous other problems that suggested the facility had been mistreating numerous patients under its care. Grace Healthcare, the company which owns the facility also owns three more facilities in Colorado as well as numerous other nursing homes across a total of eight states. A jury awarded Fraizer’s family with damages in the amount of $3.2 million, but no amount of money can account for the pain and suffering that Fraizer experienced and the lack of dignity he had in his final days. For laws related to Colorado nursing homes, look here.